This is the Great Ninja War Sai. As I’ve written about Sai in the other article. Let’s move on straight to the abilities of Sai [Great Ninja War]. Taijutsu, Ninjutsu Sealing Jutsu – Threatening [Prompt]: Cause a heavy damage to the selected opponent’s unit and Knockdown and Immobile. If killed by this skill, the unit will not resurrect. Taijutsu Super Beast Scroll – Raging Lion: Summon 1-2 Super Beast Imitation Drawing – lions to fight for you (with a high chance of summoning 2). Lions are capable of Standard Attacks. Ninjutsu Super Beast Scroll – Falconry: Chases and Attacks a Knocked Down unit, causes Repulse. Ninjutsu Super Beast Scroll – Armor Collection : When at least 2 Lions are in the field, replace this unit’s Standard Attack always cause High Float. Taijutsu Anbu Camouflage Tactic: Have five attributes, including Water, Wind, Lightning, Earth and Fire, at to protect yourself from skills. 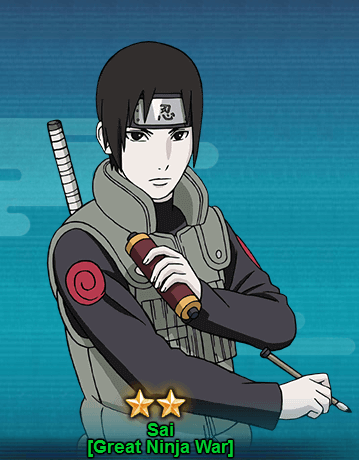 You can get Sai [Great Ninja War] from the Edo Tensei Treasure. You need to draw 10 seal scrolls to get Sai [Great Ninja War].